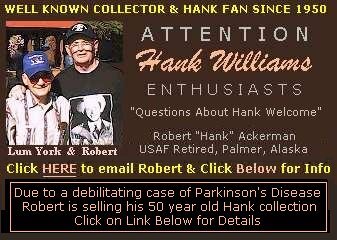 It seems like a long time since I had 750 HANK FANS on my e-mailing list - but due to illness (Parkinson’s Disease) I had to give up something I loved and enjoyed and consider finding a good home for my collection. Ideally it would be nice to sell the whole collection or large portions of it to various people - and although seemingly impossible I want to try. I can see that it would be worth someones time to consider hiring a truck and driving to Palmer, Alaska to get it all (as long as the price is right). It may well turn out to be a giveaway! I mention coming and getting the items because I can’t psychically do the work necessary for shipping it all. It might be practical for someone to buy the stuff and make a fortune selling individual items. I am kicking around the idea of what offers I might take or consider - maybe five or six thousand?? 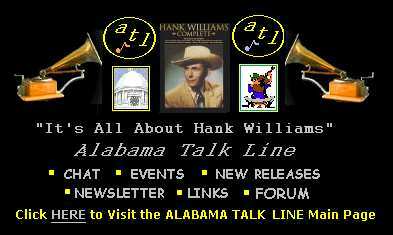 Click HERE For information about the HANK FAN MAILING LIST & Robert Ackerman's combined songwriting efforts with Dustin Hunt and Jim Murphy. 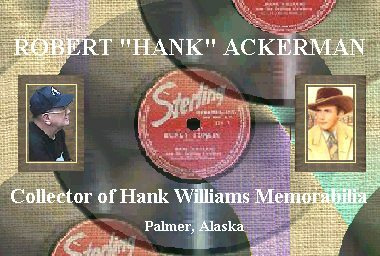 Of Special Note: "Hank's Old Scratched Record"